A second attempt to block a libel action brought by a UK TV presenter against Arnold Schwarzenegger and two aides has failed in the High Court. Anna Richardson is suing the California governor and two of his aides over comments they made about her claims that he groped her in December 2000. In January, the Appeal Court ruled the actor's spokesman could be served with UK libel proceedings abroad. Now Mr Justice Eady has ruled the actor can also be served with proceedings. Ms Richardson is suing Mr Schwarzenegger, his spokesman Sean Walsh and another publicist, Sheryl Main, claiming they tried to ruin her reputation by dismissing her assertions the Terminator star touched her breast during a press event at London's Dorchester Hotel. She alleges that following her revelation, his spokespeople - Mr Walsh and Ms Main - libelled her in a Los Angeles Times article that also appeared on the internet. Her libel action contends that Mr Schwarzenegger's staff said she encouraged his behaviour - a statement she believed had tarnished her reputation as a professional interviewer. Mr Walsh had previously made unsuccessful attempts to get the case thrown out, arguing that English courts had no jurisdiction. 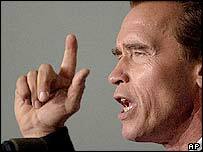 On Wednesday, Mr Justice Eady said he could find no convincing reason why Mr Schwarzenegger could not also be a proper defendant in an English court case. Barrister David Sherborne, representing Ms Richardson, called Mr Schwarzenegger's attempt to block the action "hopeless and misconceived". Mr Justice Eady also refused permission for Mr Schwarzenegger to appeal.